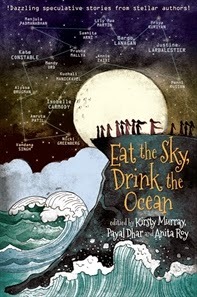 On 2 February 2015, Eat the Sky, Drink the Ocean, the "ground-breaking intercontinental collection of speculative stories" from India and Australia, will be published. A collection of sci-fi and fantasy writing, including 6 graphic stories, showcasing 20 stellar writers and artists from India and Australia: Isobelle Carmody, Penni Russon, Justine Larbalestier, Margo Lanagan, Lily Mae Martin, Kuzhali Manickavel, Prabha Mallya, Annie Zaidi, Kate Constable, Vandana Singh, Mandy Ord, Priya Kuriyan, Manjula Padmanabhan, Samhita Arni, Alyssa Brugman, Nicki Greenberg and Amruta Patil. Kirsty Murray and Isobelle Carmody have recently been in India launching this book, and no doubt there'll be some cool events this summer associated with its release. For the moment, you can go and have a look at its dedicated page on the Allen & Unwin website. Remember our Prime Minister being applauded for promising a new national Book Council at his Awards ceremony last week? Looks as if it’s going to be funded by a cut to the Australia Council of $2 million a year for three years. To make clear what this means: Ozco’s literature funding has been steady at around $4 million per annum for a ridiculous number of years, apart from a short-lived increase under the Rudd and Gillard governments. I was on the Literature Board for 3 years, helping spread the available funds as widely and wisely as possible among increasing numbers of grant applicants. $4 million sounds like a lot, but it’s bugger-all compared to what goes to other art forms, and it doesn’t go far. A lot of excellent work goes unfunded, which is why Ozco staff will always tell you to keep applying, because you never know what your chances might be next year. Just in case anyone’s thinking (and a surprising number of people do) that writers are wealthy whingers, ’cause just look at JK Rowling and stuff: According to Ozco’s 2007-2008 economic study of professional artists - http://www.australiacouncil.gov.au/…/do_you_really_expect_t… - the 7,600 professional writers in Australia were the least well rewarded artistic occupation for their creative work. Their mean annual income from writing was $11,100. Even their total incomes (from all work including non-arts work) were lower than all occupational groups, including blue-collar occupations. Between 2001 and 2008, writers’ mean incomes from writing fell by 52%. A fresh study is expected in 2016, but no one expects things to have improved. If you’ve ever received, applied for or considered applying for an Arts Council literature grant, I suggest you go to the Attorney-General's department's feedback page and ask for details about this new body (who will be responsible for it, what it will be charged with doing, where the money will come from and how and where it will be spent), and express whatever concern/outrage/disgust you feel at the idea of already meagre funds being taken from supporting artists to fund another layer of bureaucracy. Arts Minister Brandis needs to see that we are watching this and demanding some accountability.